2018 Aprilia RSV4 RF. Picture credits - Aprilia. Submit more pictures. The dynamic control suite is still the only of its kind to offer auto-calibration and wheelie control and includes: ATC (Aprilia Traction Control), AWC (Aprilia Wheelie Control), ALC (Aprilia Launch Control) and AQS (Aprilia Quick Shift). Front suspension: �hlins NIX fork with TIN surface treatment. Rear suspension: �hlins TTX monoshock with piggy-back, fully adjustable. Comments: APRC System (Aprilia Performance Ride Control), which includes Traction Control (aTC), Wheelie Control (aWC), Launch Control (aLC), all of which can be configured and deactivated independently. Bosch 9MP switchable ABS. Ask questions Join the 18 Aprilia RSV4 RF discussion group or the general Aprilia discussion group. Bikez.biz has an efficient motorcycle classifieds. Ads are free. 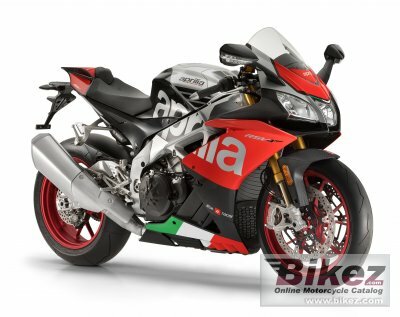 Click here to sell a used 2018 Aprilia RSV4 RF or advertise any other MC for sale. You can list all 2018 Aprilia RSV4 RF available and also sign up for e-mail notification when such bikes are advertised in the future. Bikez has a high number of users looking for used bikes. Before you buy this bike, you should view the list of related motorbikes Compare technical specs. Look at photos. And check out the rating of the bike's engine performance, repair costs, etc.